Ancient kazakh (?) flag in "Book of all kingdoms"
Status: Internationally recognized independent state since 16 December 1991. Member of the United Nations and the Commonwealth of Independent States. Notes: The region we now know as Central Asia was conquered by Russia in, for the most part, the period between 1730 and 1850. After the Bolshevik revolution, the Kirghiz ASSR (not to be confused with what is now Kyrgyzstan) was set up. This changed its name to the Kazakh ASSR in 1924 and became a full Union Republic in 1936. According to Pierre Lux-Wurm, the word "Kazak" appeared in the Turkish language and in Russian documents around the XIVth century. Its original meaning was "independent, tramp" and it was used to designate the nomadic peoples from Central Asia. The history of the Kazaks before the XVIIIth century is less-known due to the lack of local written sources. The Kazak tradition says that their common ancestor divided them into three hordes ("jouz"), the Greater Hord (Oulog Jouz), the Middle Horde (Orta Jouz) and the Lesser Horde (Kichi Jouz). The names of the hordes were not related to their size but to the relative age of the three sons of the ancestor, the elder, the second, and the younger. In 1602, the Kalmuks led by Khan Urluk and the Djungar Mongols devasted the steppes. The Kazaks call this era "aktaban choubroundi" (the big disaster). The Djungars came back in 1710 and 1713 and seized between 1722 and 1727 most of the lands of the Greater and Middle Hordes. The Lesser Horde called for the Russian protection, which was acknowledged in 1734. Following a revolt in 1860, Kazakstan became a colony, officialy regulated in 1868 and considered as a "zone of agricultural colonization". Kazakhstan Flag was firstly adopted by Law "bout State Flag of the Republic of Kazakstan" 4 July 1992. State Flag of the Republic of Kazakstan is a rectangular piece of cloth of sky-blue colour bearing in its centre a sun with rays, with a soaring eagle undeneath. Images of the sun, rays and the eagle are of golden colour. At the left part ot the cloth is a vertical band of national ornament. This Law was officially published in the newspaper 'The Kazakhstan truth' #130-131. The author of this flag - Shaken Nijazbekov. On July, 1992 the color of ornament was changed from red to golden and the alterations were made in the text of the Law. The national flag of the Republic of Kazakhstan is a a piece of right-angled cloth of sky-blue colour with a picture of a golden sun with its 32 rays in the centre, under them - a soaring steppe eagle. Flagstaff has vertical line with national ornament.The picture of sun, its rays, eagle and ornament are of golden colour. Width/length ratio of the flag is 1:2. The national emblem of the Republic of Kazakhstan is a picture of a shanyrak ( the cupola of a yurta) on a blue background, from which uyks (body bracket) like sun rays are being radiated in framing of wings of mythical horses. At the bottom of the emblem there is an inscription "Kazakhstan". In colour picture the National Emblem of the Republic of Kazakhstan are of two colours: golden and blue-and-sky-blue. National Flag of the Republic of Kazakhstan is a rectangular piece of cloth of sky-blue colour bearing (in its centre) a design of the sun with rays, with a soaring eagle undeneath. All along the flagstaff there runs a vertical band of national ornament. Images of the sun, its rays, the eagle and the ornament are of golden colour. Width/length ratio of the flag is 1: 2. New Constitutional Law on State Symbols of the Republic of Kazakhstan No258 was adopted at 4 July 2007 and published in on 5 June 2007 in official "Kazakhstan pravda" bulletin. The description of the Flag was not changed. 810U or 810C for a buff-type color (for non-textile). 102 Yellow is used for the actual flag and that 810 Buff is used when the flag appears as a graphic element. Below I'll also give a color breakdown into CMYK, RGB and Web-safe for those who may be interested. Section 3.2.18.2 gives a separate colour specification. I hope a proper translation will confirm that this specification is for items containing images of the flag and is a preliminary specification until a catalog of models of colours for the symbols of state is established by a commision into the symbols of state. In any case, the colours are given in terms of the Pantone Formula Guide for glossy paper and dull paper - blue 3125C or 3125U respectively and yellow 810C or 810U respectively. STATE STANDARD OF THE REPUBLIC OF KAZAKHSTAN. ST-RK 988-2007. "THE STATE FLAG OF THE THE REPUBLIC OF KAZAKHSTAN. General technical conditions". The Standard adopted by the Head of Committee on technical regulation and metrology Order No 578 from 19.10.2007. The protocol manual for the London 2012 Olympics (Flags and Anthems Manual London 2012 ) provides recommendations for national flag designs. Each NOC was sent an image of the flag, including the PMS shades, for their approval by LOCOG. Once this was obtained, LOCOG produced a 60 x 90 cm version of the flag for further approval. So, while these specs may not be the official, government, version of each flag, they are certainly what the NOC believed the flag to be. First flag of Republic of Kazakhstan adopted by Law of June 4, 1992 had red national ornament. This Law was officially published in the newspaper 'The Kazakhstan truth' #130-131. The author of this flag - Shaken Nijazbekov. On July, 1992 the color of ornament was changed to golden and the alterations were made in the text of the Law. I'm still very dubious about the actual existence of the flag quoted as "First variant of the Kazakhstan flag (1992)". AFAIK, there is no such evidence than the reports of these years quoted in the vex-bulletins and copied to each others. No need to remember you, I guess, the main source of these reports. At last almost all of them proved to be imaginary. The copy of the original Law I own, dated 4 June 1992, Law No. 1372-XII, does mention already the ornament to be yellow, and is not known (at least by me, if anyone knows, please share it with us) another Law, neither before nor after this, prescribing the ornament in red or changing it from red to yellow. My guess is that the flag with the red ornament was a proposal, among others, and at the time of the flag to be selected and the Law officially published, the flag with the yellow ornament was chosen, instead of the one with red ornament. Here's http://www.religio.ru/news/11720_photo_1133537617.html a nice photo of the flag of Kazakhstan flying in strong wind. Note the curious finial. http://www.geraldika.kz/p_b_flag.htm Entitled "Annex B", various drawings with precise measures for the construction of the flag. http://www.geraldika.kz/tehn_flag.htm Entitled "Technical requirements", official description of the flag and colours (Pantone) to be used: 3125C (sky blue) and 109U (yellow). The starting page shows the text of the Law about State symbols of 24 January 1996 and also links to two other "specifications" devoted to the State coat of arms, also with construction diagrams at http://www.geraldika.kz/gost.htm. "Vlaggen van de wereld" mentions that on the flag of Kazakhstan the sun symbolizes energy and warmth, and that the eagle stands for freedom. Main element of Kazakhstan flag is its color. The light blue color is a symbol of sky and water. The pure light blue color also symbolizes cultural and ethnic unity of Kazakhstan people and the indivisibility of Kazakhstan country. The sun is the source of life and energy. That�s why the silhouette of the sun symbolizes life. Human being is not eternal and human life is measured in some way by time. Nomads - the ancestors of Kazakhstan people - used the sun�s movements to measure the time. The sun is also a symbol of wealth and abundance. If you look at Kazakhstan flag a little closer you will see that the sun�s rays are like grain. And the grain is the basis of abundance and prosperity. The total number of rays is 32. Among the nomad people the golden eagle plays very important role. People of different Kazakhstan tribes had the golden eagle on their flags for centuries. The eagle symbolizes the power of the state and astuteness. For Kazakhstan people as for people of the steppe the eagle is a symbol of independence, freedom and flight to future. Also the eagle is strong enough to repulse anyone who is preventing this flight to future. The eagle symbolizes the attempt of young Kazakhstan state to become the important part of world civilization. The line placed in parallel with Kazakhstan flag staff consists of national ornamental pattern. It is Kazakhstan national ornamental pattern �koshkar-muiz� - horns of the ram. This flag was published on the website of the Turkish government and series of Turkish postage stamps. They were very common in the Turkish official iconography. There wasn't actually a Kazakh Khanate but there were independent Kazakh Tribes in Central Asia during that time. I don't know the origin of the flag but it is certainly possible that it existed. These were located in what is today modern Kazakhstan. Is it only me, or does a flag with three five-pointed stars neatly aligned down the hoist look suspiciously modern for a flag purporting to date to 1456? But then again, the khanate itself did not exist. nomadic peoples from Central Asia. The history of the Kazaks before the XVIIIth century is less-known due to the lack of local written sources. The Kazak tradition says that their common ancestor divided them into three hordes ("jouz"), the Greater Hord (Oulog Jouz), the Middle Horde (Orta Jouz) and the Lesser Horde (Kichi Jouz). The names of the hordes were not related to their size but to the relative age of the three sons of the ancestor, the elder, the second, and the younger. In 1602, the Kalmuks led by Khan Urluk and the Djungar Mongols devasted the steppes. The Kazaks call this era "aktaban choubroundi" (the big disaster). The Djungars came back in 1710 and 1713 and seized between 1722 and 1727 most of the lands of the Greater and Middle Hordes. The Lesser Horde called for the Russian protection, which was acknowledged in 1734. Following a revolt in 1860, Kazakstan became a colony, officialy regulated in 1868 and considered as a "zone of agricultural colonization". The kazakh (?) flag from "Book of all kingdoms": Bocarin + Cato, as of late 14th cent. New standard of the President Republic of Kazakhstan was adopted by Decree No 414 31 October 2012. New standard was hoisted 1 December 2012 at the residention of President N.Nazarbaev. Description of the flag: the Standard of the President of the Republic of Kazakhstan is a light blue rectangular field with the proportions 2:3. The middle of the field is charged with a golden circle in which is inscribed the image of a young tribe leader of the Saks era [first century B.C.]. His right hand is raised, he is sitting on a winged snow leopard. The hand of the man has a bracelet, the neck has a necklace, the head is wearing a pointed hat. The image of the man and of the leopard is in gold. Under the leopard are some mountains with snow. [These are probably gold]. On the bottom of the standard are written the words in Kazakh "Standard of the President of the Republic of Kazakhstan" in gold. The flag is has a gold fringe on three of its sides. The hoist has a peak in bronze of the "kochkar mouilliz" (?) type to which is attached a decorative tassel.The hoist is ornated with silver nails bearing the engraved names, surnames and patronimic names of the Presidents of the Republic of Kazakhstan in the official language and the dates of taking office and resigning. This flag is put in the President's office in the new capital. It is also put on its residence in the capital, on all other residences and its means of transport. It is used in all ceremonies with the Head of State. It was adopted by decree n�2736 of the 29 December 1995. Dark blue (i.e., clearly darker than the national flag, and as such shown when displayed toghether), with the national emblem in golden on the center (approx diam. : half the flag's height) above an inscription reading "Казақстан Республикасы Президентікіқ Байрагы" ("Kazak,stan Respublikasy Prezidenti.ki.k, Bai~ragy") in golden cyrillic handwriting letters. 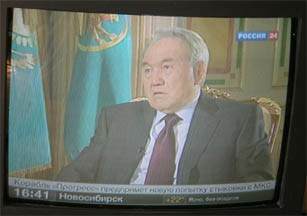 Yesterday (6.7.2008) I saw TV-report with interview of President of Kazakhstan N.Nazarbaev. Presidential standard was behind him (see the photo). I think there is no inscription. To support my previous opinion about KZ standard without inscriptions: Several days ago I saw TV-report about president of KZ N.Nazarbaev. The presidential standard behind him, I think, was without any inscriptions (see photo from my TVset). The small flag on the car was without inscription too. The flag of the National Olympic Committee of the Republic of Kazakhstan is shown on its official website http://www.olympic.kz/content.php?id=068. The flag is white with Committee emblem in the center. 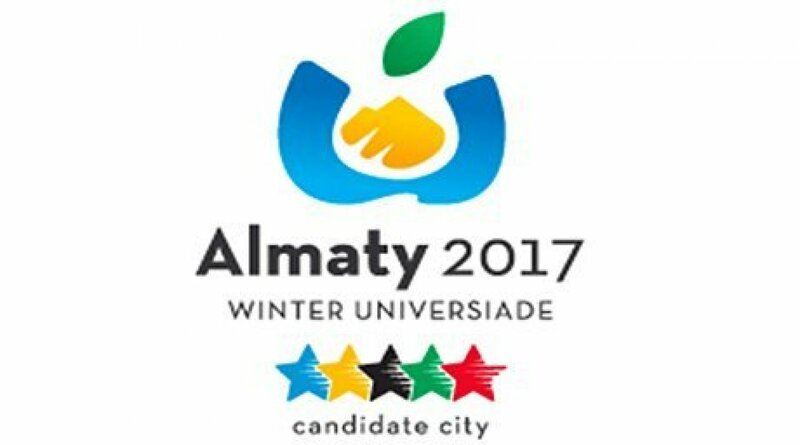 Emblem contains Kazakhstan flag and Olympic symbol. New flag of NOC of Kazakhstan is also white with logo. Yesterday, during opening of the football (soccer) match Kazakhstan vs Germany briefly the flag of the Kazakh Football Association (KFF) was to be seen. The flag is white with the logo of KFF. Flags of football club "KAIRAT" (Almaty, Kazakhstan). Different variants made according photos. 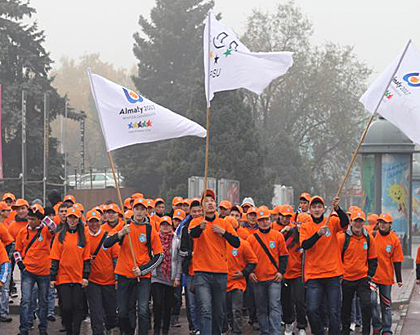 Flag of the "Adilet" Academy of Jurisprudence in Almaty, the previous capital of the country, from http://www.adilet.kz/html/vuz/simvolika/simvoliks.htm. Federation of Trade-Unions. Kazakhstan. Image from http://old.vkp.ru/about/r_kazah.html.